It is a ritual we stumbled upon by accident, but it feels just right for our family, to take a moment alone together to mark the milestone that their seventh birthday symbolises. We walk together through nature as a rite of passage from early childhood into the burgeoning independence of the older child. 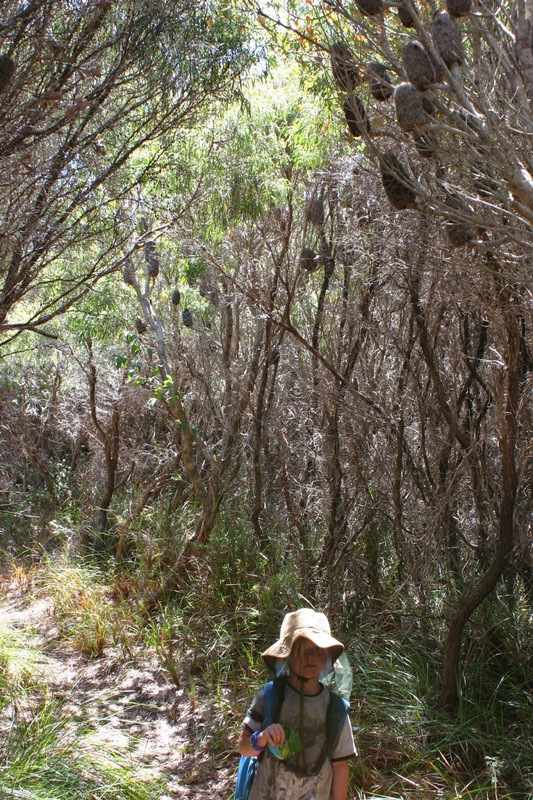 Taking a small section of the Bibbulmun Track, the long distance walking trail that winds between the city and the south coast, we shoulder our packs and wander through the wilderness together; mother and child. I chose a shorter, easier section of track for Darcy's seven-year-old walk than I had for Lewis - taking into account the season and the length of his legs. An easy 8km walk seemed just right for summer, then a 4km stroll the next day to a swimming spot for a splash around before we headed home. That was what we planned anyway. And setting off into a drizzly, grey summer morning I was happy to go as slow as Darcy liked, although we did not like to linger around the shooting range near Muttonbird Island, where the crack of gunfire broke the still morning air. Rain drops dripped from spiderwebs as we wound our way through the dunes dotted with gnarled hakeas and banksia trees. I let Darcy take the lead, and we stopped to marvel at the wonderful creatures his keen eyes spotted in the undergrowth. Beetles splashed with spots of colour like an Aboriginal dot painting; praying mantises with lumpy, amorphous abdomens; spiders nestled inside banksia flowers. After I spotted our first snake slithering away into the leaves I decided I had best lead the way - and three quite enormous tiger snakes and dugites later I was rather glad I had. We sauntered into the shelter before lunch and were congratulating ourselves on our effort when I realised we were not at the shelter I had planned to spend the night at. No, a laminated sheet informed me that the shelter marked on our (brand new) map had been demolished some years earlier. 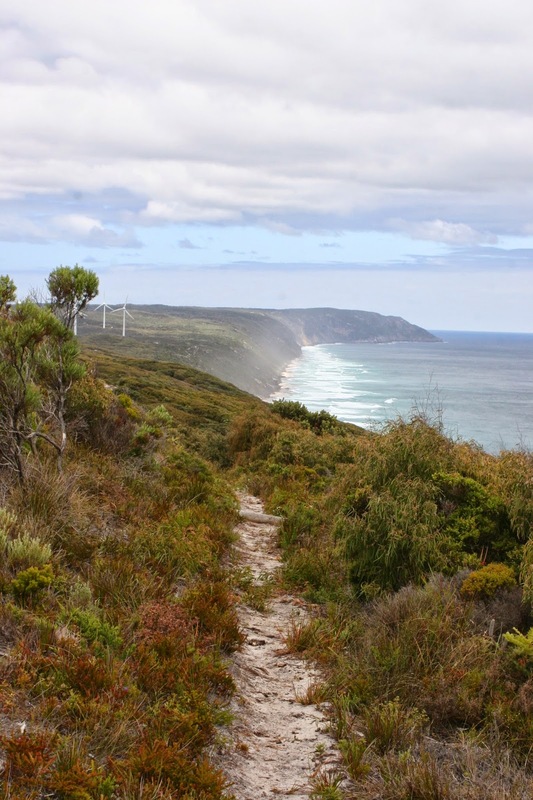 We had only walked a few kilometres from the road and had another 13km to go before we would reach the next shelter, the other side of the wind farm. I did not know if Darcy's legs would be up to the challenge, but he assured me in the most eager of voices "I can do it - I will try my best." So we ate a quick lunch, pulled our packs back on and headed back onto the track. Winding through peppermint groves and along windswept limestone outcrops, we counted the turbines and mentally ticked off each one as we passed by. Eighteen in all. We stopped to take long drinks of water and eat jelly snakes and dried apricots. I took the sleeping mat and bag out of Darcy's pack and stuffed them into the top of my pack, but after he lay down on the paragliding launch pad I was not sure I was going to be able to get him to keep going the last few kilometres. "I said I would do my best, and I have," he sighed. He found just a little more energy in his legs and we walked into camp at five in the afternoon. He climbed into the hammock some thoughtful hiker had left hanging there and basked in the warm glow of achievement, fatigue soaking through every muscle and bone, as I prepared dinner. We played cards and read Enid Blyton and watched the stars come out from beneath the billowing folds of our mosquito net. In the morning we climbed the hill to the lookout and ate breakfast with the endless blue of the Southern Ocean stretching before us. Then it was a two kilometre scramble back down the track to Sandpatch, where we dumped our packs and scampered down the 500 steps to the sea. The waves surged onto the thin strip of sand and I washed away the dirt and sweat of the trail while Darcy hunted for crab carapaces on the rocks. As a second born child Darcy has always had to share my attention, but it felt so good to focus on him alone for just one day. He is the quietest of boys with a gentle, caring nature and he holds a very special place in all our hearts. I think his baby sister was as excited to see him as she was to see me after our first 24-hours apart. My breasts were heavy with milk and I sat and fed her while Darcy ran down and up one thousand steps with his brothers. After draining one side Thea was ready to join them. And it was back to the noise and chaos of life with four children again - feeling slightly unbalanced and lopsided after our time alone together. But I have learned by now that those moments of quiet and balance, those small sips of perfection, are always fleeting. Normal life is more of a see-saw as we lurch from one week to the next, and that is just fine. This was such a lovely read. I really like this ritual, it's meaningful and peaceful and they will always remember it. Happy birthday to Darcy. Thank you Jennifer. I think the walk was made even more memorable by the challenges we had to overcome, but he was such a trooper. It really is a very special thing to do together. What a wonderful way to spend one on one time with your child and celebrate a milestone. A memory cherished forever. Snakes just love basking on walking tracks around here too. Despite Darcy's enthusiasm for snake spotting my heart gave a leap every time I saw one basking in front of me and I gave an involuntary gasp, which made them slither quickly away. He was so disappointed he missed them. I was just glad not to have stepped on them! You should do it! The past two years slipped by in the blink of eye and I know that Quinn will be seven before I know it and I will be back out there again (although I owe my eldest boy a walk before then). Thanks for reading! Love it Alison...and there YOU are too! Life is a bit of a see-saw isn't...I quite like that analogy. feels right. Thanks Nicole. We had one of those close calls with Lewis when he was three and it left me shaken for weeks. I am trying to get past that fear now that Thea is going to stop breathing every time she trips over in the shallows. It is a shadow in my mind that just will not go away.